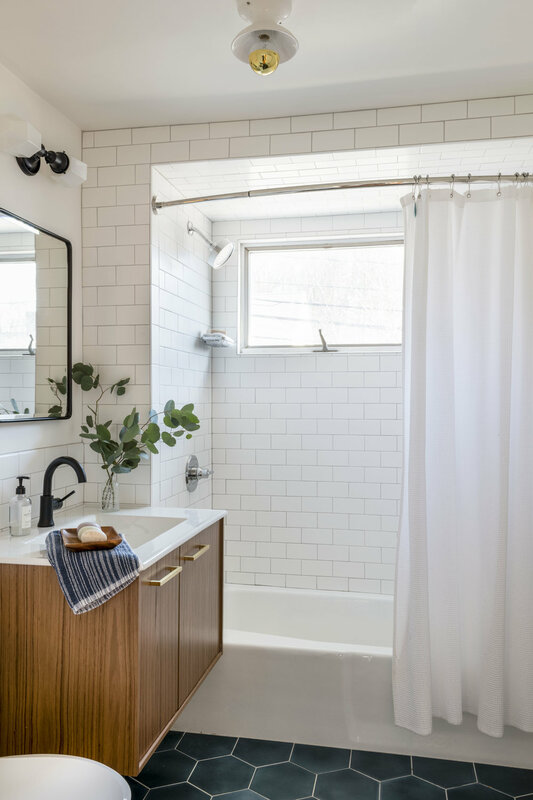 My Bathroom Renovation: The Reveal! Happy 2019! I hope everyone’s year is off to a great start. 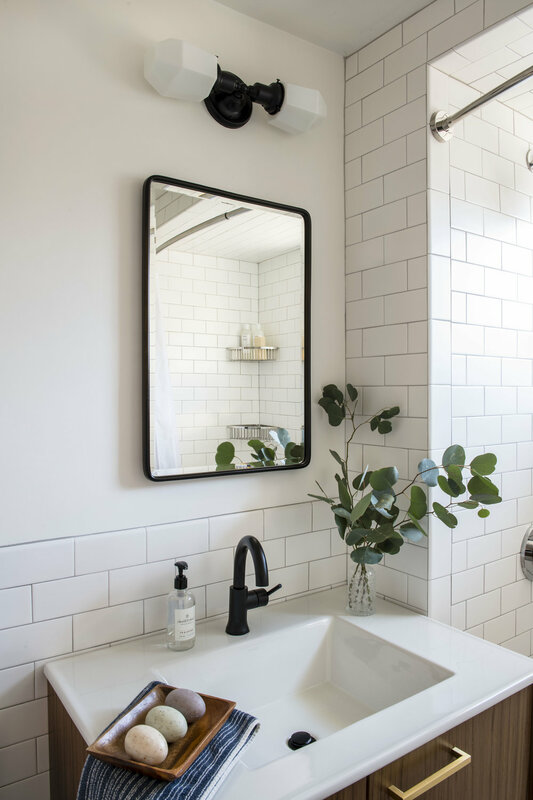 Some of you have been asking…did you finish your bathroom renovation and the answer is YES! Actually it was completed at the end of August, but due to life in general, I’m just now getting around to having it photographed and posted. We have been loving it - it’s a space you actually want to be in vs. retreat from. A quick reminder of what it looked like before. Dated, ugly, and pink. And here it is now! Modern, clean, and bright! For me, the show stopper is the floor tile. It’s cement which means there is variation in each piece - which isn’t for everyone but I love it. And the color is not quite a navy and not quite a cobalt. It’s really a lovely shade in between. By far my favorite part of this bathroom! I opted to do a wall hung vanity in order to hide the kids step stool and scale underneath. It really frees up space on the floor, which previously felt cramped with these items here and there. It makes the room feel more open, even thought the vanity is 3” deeper than before. I debated hanging a mirror above the vanity, but at the last minute ordered a recessed medicine cabinet. When we opened the wall, there was already a framed spot for it, so it felt like the right thing to do. We had a snafu with the first one I ordered (which I’ll share later on) but I’m so glad we went with a cabinet as it provides a lot of extra storage for a family of 4. We were on a budget, so rather than hire a contractor, I acted as the contractor and project manager and brought in my own subcontractors who I have relationships with. There were certainly pros and cons to this approach and I plan on sharing some of those in a later post. But we did stay almost in budget because of it, and I learned a lot! In the meantime, I hope you enjoy this great before and after! I have been anxiously waiting to share this dramatic before & after of a mudroom I designed in Lexington. 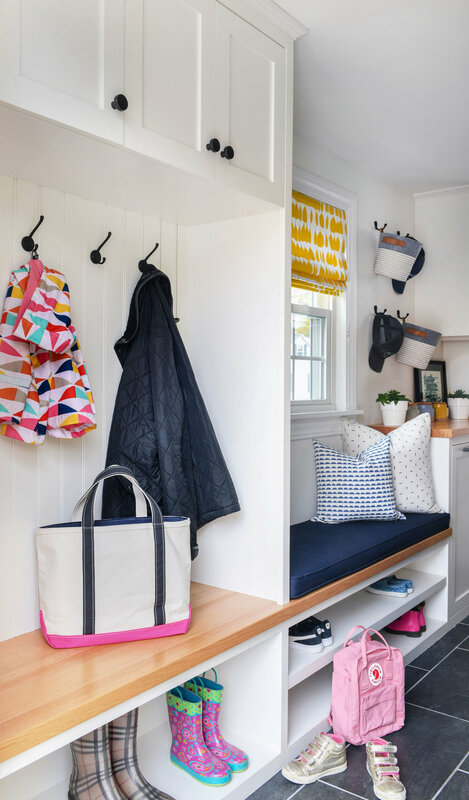 My clients hired me to redesign their mudroom in their cape style home. It was pretty dated, dark, and I’ll just say it…ugly. Here is a photo of the before. And here’s the after. Big change huh!? I worked within the existing footprint to maximize the space as there was no plan to add on, and designed all the custom cabinetry which my carpenter then built. There’s a small porch on either side of the room and doing away with one and closing in the door was not in the budget. So we kept the breezeway and got new doors that gave them more privacy but still allow light to flow through. They have two young kids so we needed to utilize the space as best as possible with places to hang jackets, store shoes, keep gym bags, and have things behind closed doors. There are lots of hooks in here for these reasons! I opted to have one large space for jackets rather than breaking it out into cubbies to maximize the amount of coats they could hang. Additionally I gave them two different spots for shoes - one for boots and another for sneakers. This room is also where they store their recycling and they desperately wanted those standard blue bins the town provides gone. Again the space is narrow so I designed these pull out bins that hold a standard trash can turned sideways allowing them to sort and keep their recyclables out of sight. 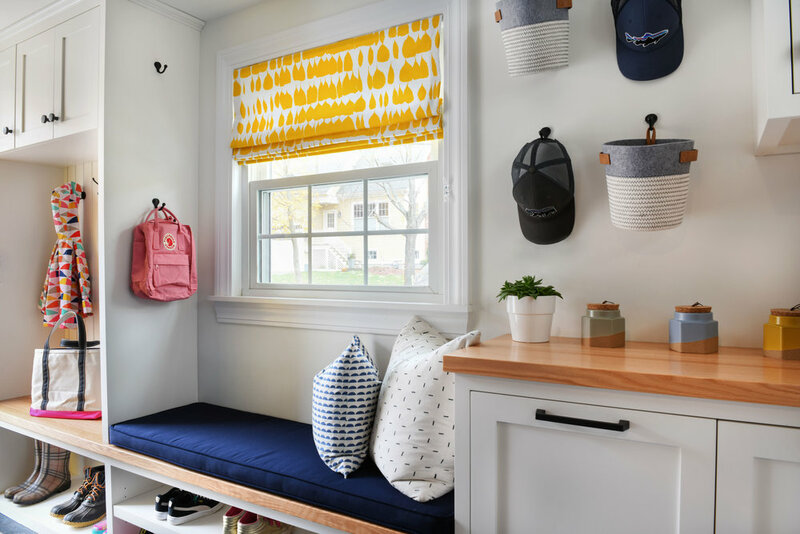 Finally we included a bench seat covered in a Sunbrella fabric under the window and added a pop of yellow using one of my favorite fabrics, Schumacher Queen of Spain, for the roman shade. Let’s be honest, the space typically has a lot more stuff in it (I mean they’re an active family of four), but as my client said, even if it’s a hot mess at times, at least it’s a pretty hot mess.